It seemed like winter would never end, but Spring is finally here! With it, we finally have a string of wet, rainy days that gives us a break and some down time to write a Spring update for you all to see what we've been up to! Farmer Figgins has been busy starting seeds in the greenhouse this Spring. We've started tomatoes, tomatillos, ground cherries, peppers, sunberries, herbs, kale, cabbage, broccoli, brussel sprouts, celery, cucumbers, summer squash, melons and watermelons. We've dedicated a bed in the greenhouse to our first cool season planting, with lettuce heads, cut lettuce mixes, arugula, swiss chard, turnips, radishes, and some new greens tatsoi and mizzuna. Soon we'll be transplanting tomato, pepper, and cucumber seedlings into the greenhouse. Outside in the garden, we've been busy planting a new perennial area. We've transplanted wild red raspberries and black raspberries and red currant bush from our wooded area, as well as a new berry we're trying called Jostaberry. We will be growing them in permaculture guilds along with onions, garlic, shallots, leeks, kale, and more early season greens and root crops. As soon as the soil dries we'll be adding herbs, strawberry and asparagus plants to this perennial area. We've also seeded our second planting of cool season roots and greens. We're glad to say that with this most recent rain we are finally seeing our peas sprouting! We had a string of 70-80 degree days last week that kept the soil dry and the seeds below the soil. Next up for planting will be green beans, cucumbers and summer squash! 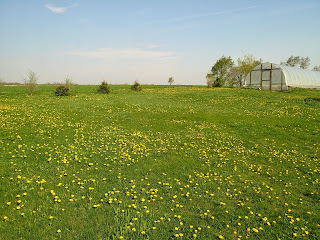 Elsewhere on the farm, Farmer Figgins has been putting in more perennial plants. 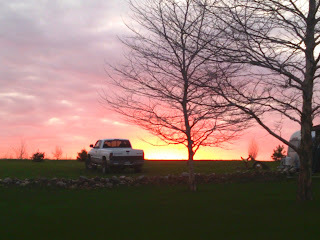 We purchased a few new trees from Gurney's, two Mulberry trees, a Pecan tree, and a hardy Almond tree. From the Ionia Conservation District tree sale we picked up a bunch of highbush cranberries and hazelnut trees (super cheap! check them out!). These we've planted to fill in gaps in our hedge by the road, and to start a hedge along the west side of the farm on top of the hill, as well along the steep downhill of our pasture to capture and hold some of the water that runs downhill. We should see our first harvest in 3-5 years! In total this year we've planted around 25 trees and 40 berry bushes! So far, Pippin has only eaten one of them. In the orchard, our apple, pear, and cherry trees are all in bloom. 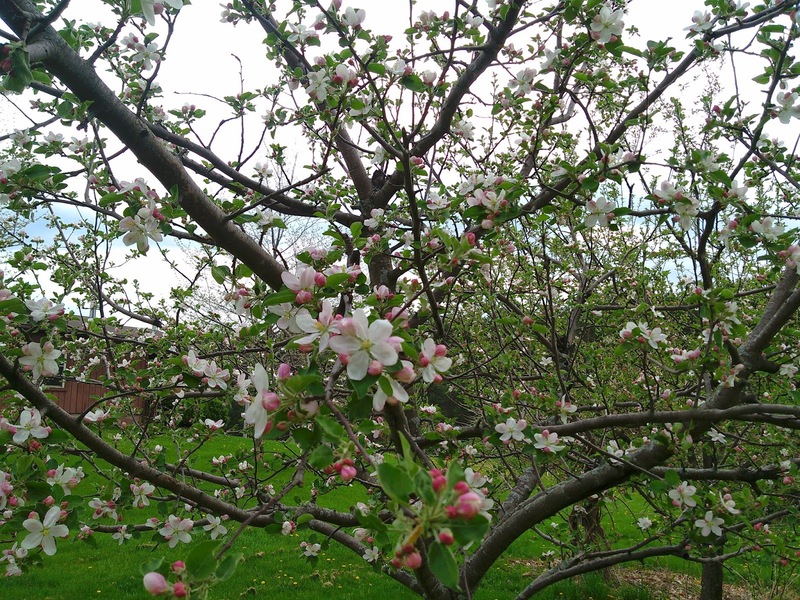 Last year a series of heavy rain storms knocked off most of the blossoms, giving us no fruit. We're hopeful the weather will hold this year and we'll see fruit again this summer. There's nothing better than homemade, homegrown apple pie and apple sauce! Out in the field, our pastures are now grown over 6" so we've set up our electric fencing for the cows and pigs. 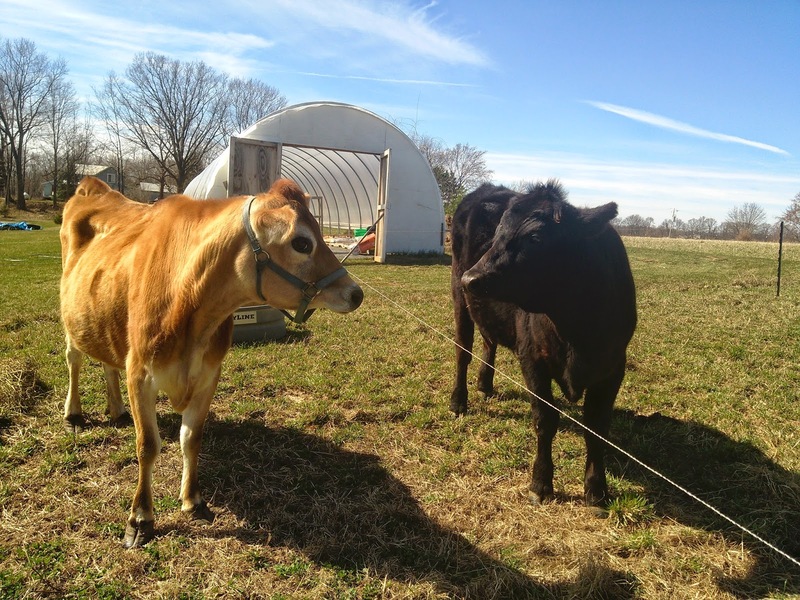 The cows are glad to be back on fresh pasture, and are gaining back any lost winter weight quickly. Pippin will likely be with us until the end of this fall, at which point he will be ready for the freezer and the grill! We've set up their pastures to make rotating them quick and easy, if only the deer would stop running into the fences and breaking the wire! 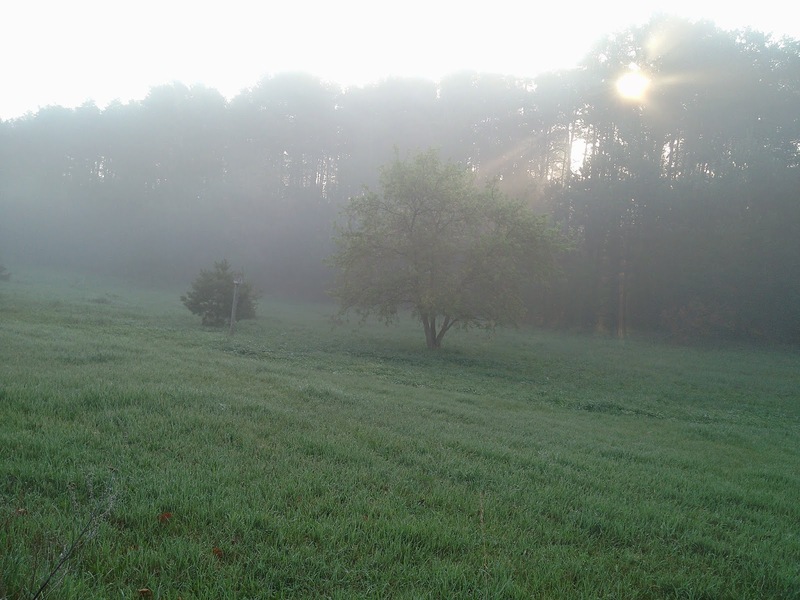 We're going to try stringing another wire along the outside of the pastures with CD disks attached to them, to catch the light and alert the deer to the fence. We have 7 piglets this year, of Berkshire and old spot breed, from Eden Farm in Greenville. 5/7 are female, the other 2 are male. We're running out of shows/books that have so many female characters, so we've named this batch of piglets after characters from Buffy the Vampire Slayer. 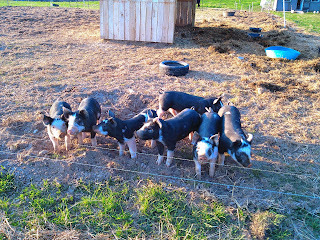 We'll likely be keeping a female out of this bunch as a sow so we can raise our own piglets in the future. If anyone out there has a Duroc boar or knows of one, please let us know! That would be our preferred breed mix because the Duroc are very winter hardy and don't get sunburns like most other breeds. Right now we have the piglets started in Pippin's winter pasture area. 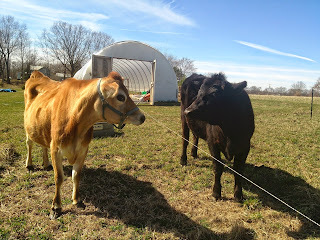 They are rooting and mixing up the soil and the accumulation of 6 months cow manure, straw, and hay. We'll move them off this area in a few weeks to the woods after the morrell season is over, and then we'll reseed the area they kindly turned over for us with pasture seed. Thanks pigs! Our new flock of laying hens are laying quite nicely, and our old flock of hens are still quite reliable, giving us over a dozen eggs each day. Not bad for 20 2 1/2 year old chickens! 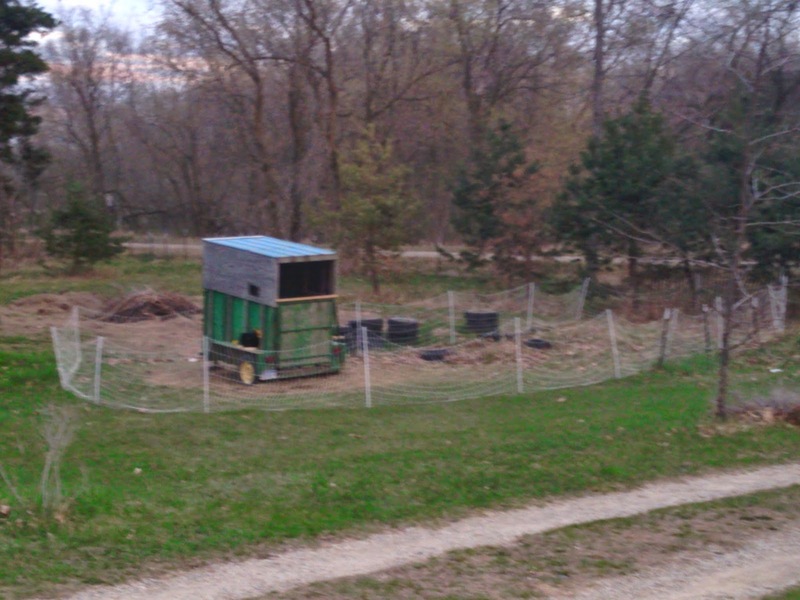 We've moved them into a mobile coop (made from our old livestock trailer). This way we can move their coop around the farm and concentrate their activity. We've had them clean up the hugelkulturs and the berry patch, and now we have them in a compost area, eating the grass and turning the compost for us! Our meat chicks are now 3 weeks old, they are feathering out nicely and growing well. We did loose some to the cold weather and snow that occurred on their first day on the farm, thankfully our hatchery sent us free replacements the next week. 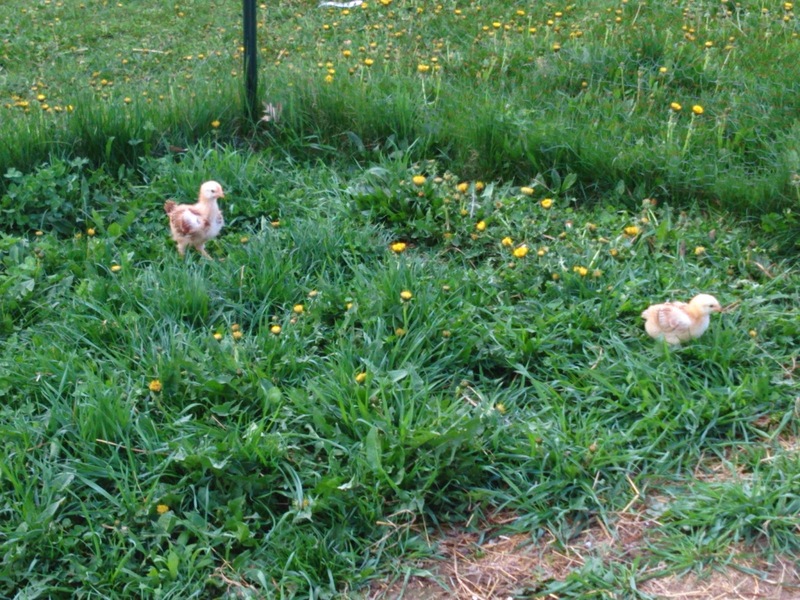 We're trying a different breed for our meat chicks this year in hopes that we have more healthy growth, and so far we're pleased. They will be going out on pasture in probably a week or two, until then they've been enjoying sampling dandelions and clover in their run-in area. 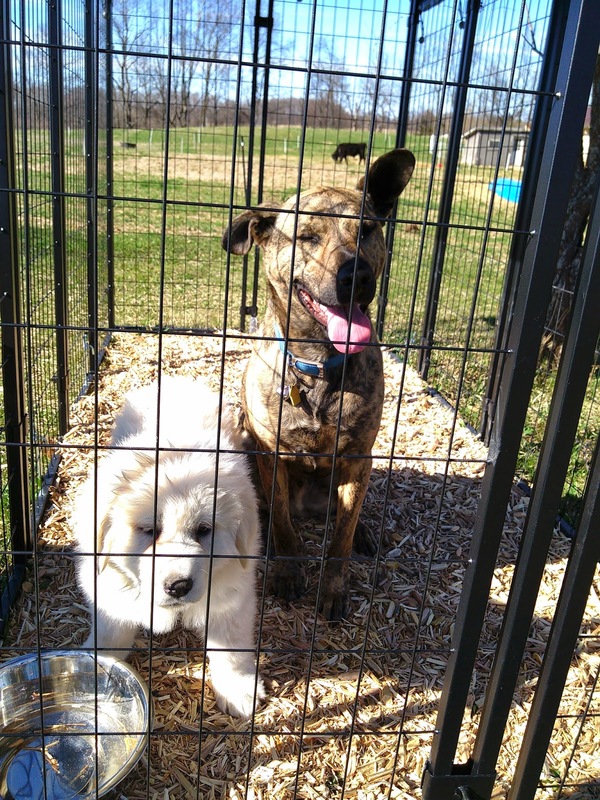 We've had a new addition this year to the farm, a livestock guardian dog! She is only a young puppy now, but we have high hopes that she'll keep deer out of the garden, and varmint out of the compost piles and away from the animals. She is a Great Pyrenees, and likely to grow quite bigger than our guard dog Ender, probably around 120 lbs when she's fully grown! We named her Korra, after the tv show character in Legend of Korra. She's already comfortable and friendly with all of the other animals; she was bred and raised by a CSA member of the farm who keeps farm animals too, so she grew up around them. 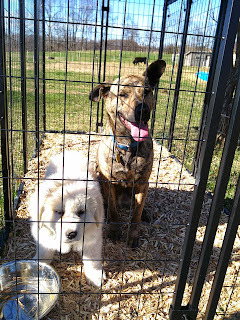 She is also very friendly with kids and people, and very calm compared to our hyper guard dog Ender. We've been working on training her and mostly trying to stop her digging habit! We also had a large batch of kittens in late winter, we have 7 kittens that are a few weeks away from an adoptable age, so if anyone is interested in a kitten for their home or the barn for rodent control, please let us know! They are free, we'd just like to find them a good home.